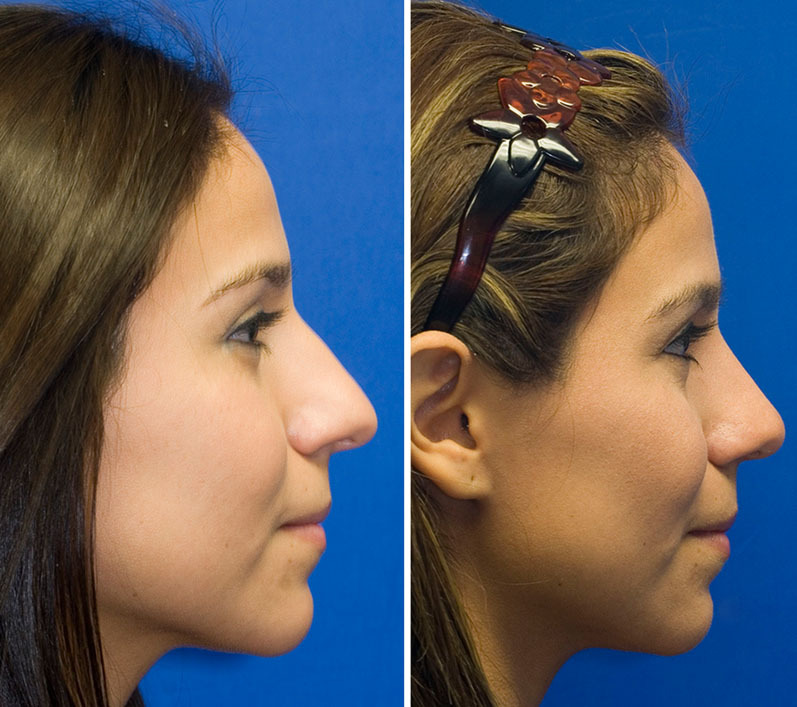 Removing a hump from the bridge is one of the most common things people want addressed during their rhinoplasty. 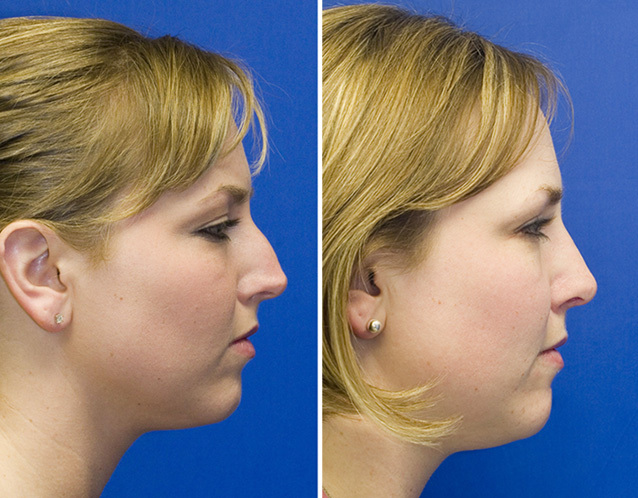 Nasal humps can range widely in size. Perhaps you just have a small bump that you'd like refined? Or maybe you have more of a Roman Nose with a more dominating, distracting large hump? 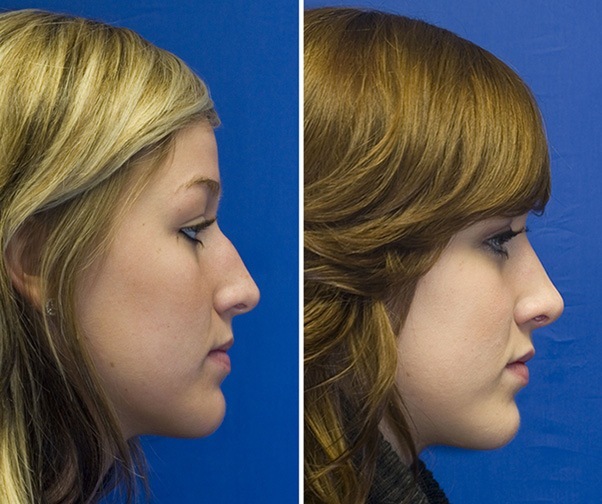 No matter if your nose falls on one of these extremes or somewhere in between rhinoplasty surgery can be used to reshape your nose. 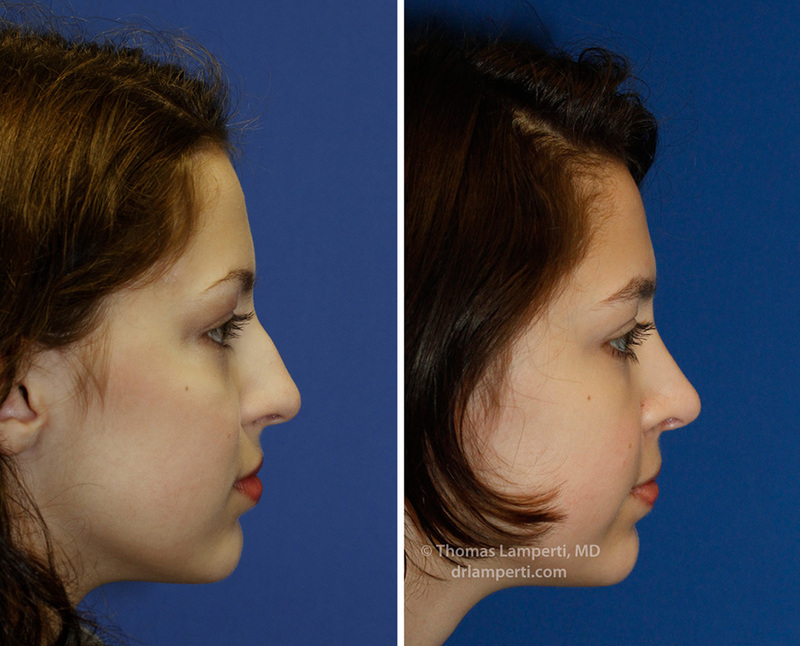 For anyone considering having a rhinoplasty to reduce a hump on their bridge there are several things to consider before having surgery. How much bridge reduction do you want? At one level the decision of how much to reduce the bridge hump is one of personal aesthetics or preferences. Some people prefer a more concave, less projecting bridge whereas others prefer to maintain a more straight (or slightly full) profile line. Some patients may want to keep some bridge fullness after surgery to maintain some ethnic or family features, or just as a personal preference. 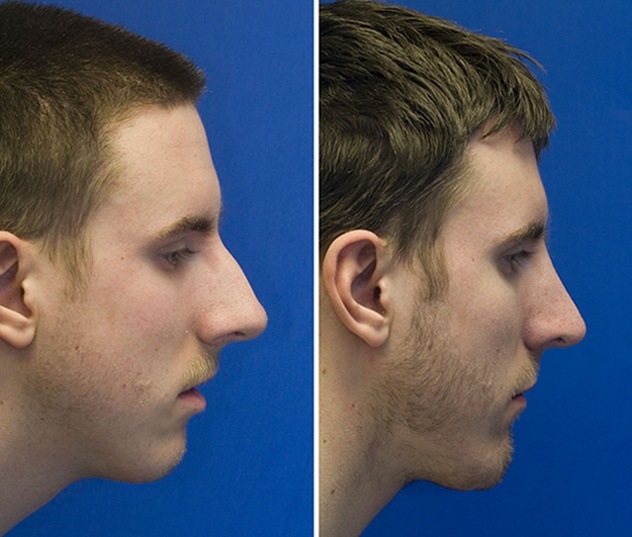 Additionally, one must consider the fact that you want to maintain the masculinity of the nose with male patients. 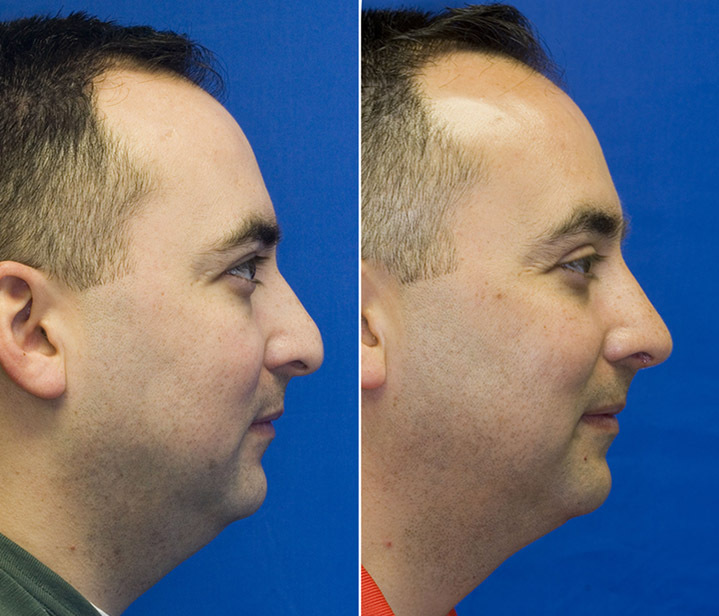 Regardless, it is important for you to communicate with your surgeon how much of a hump reduction you want. 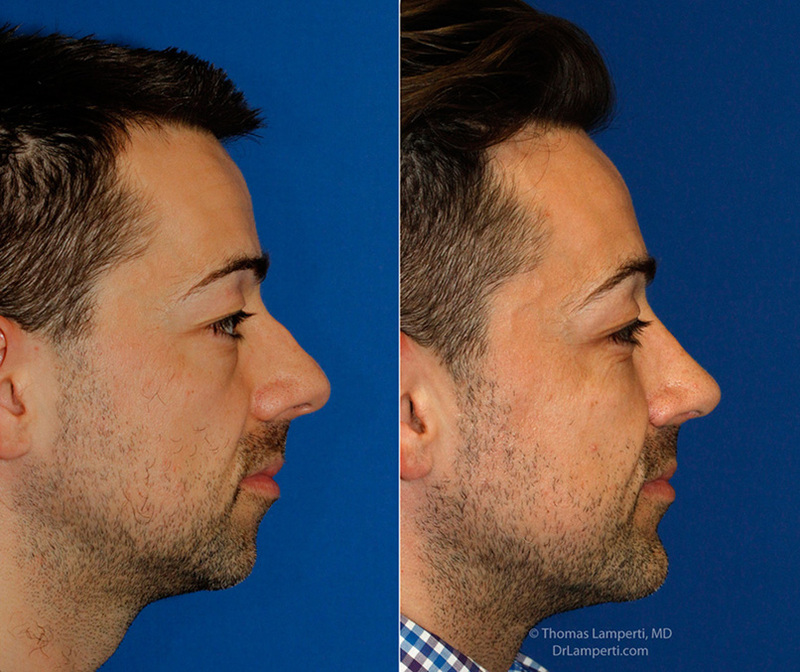 Your surgeon should be able to perform in-office digital morphing to simulate hump reduction and give you an idea how your nose would look with varying levels of hump removal. Preoperative digital morphing sets the stage for the discussion between you and your surgeon about how low you would like your bridge to be. The entire face and its proportions must be considered when deciding this as the bridge must harmonize with the overall facial framework. 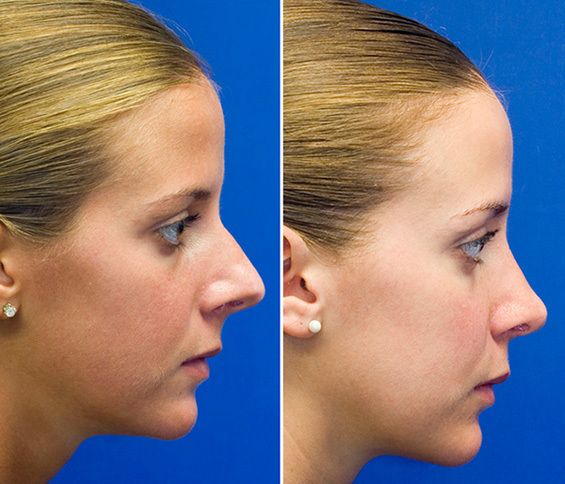 How well will your nasal skin redrape after bump removal? 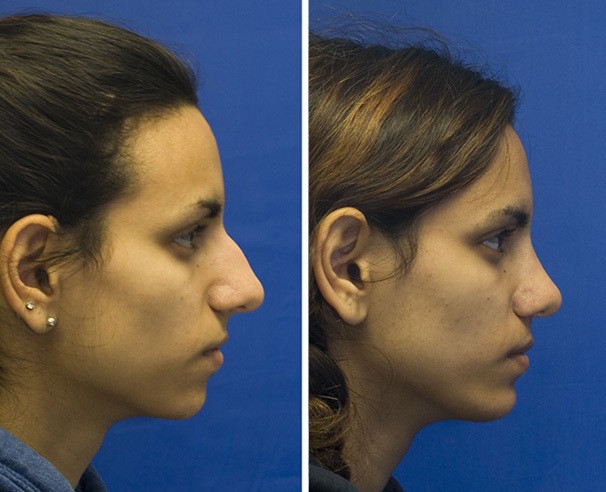 The other limitation when it comes to hump reduction (or making the nose smaller in general) is that the overlying skin must redrape over the new, smaller nasal structure. Skin isn't removed during surgery, but thanks to the underlying elasticity of the skin it will contract around the new, smaller nose. 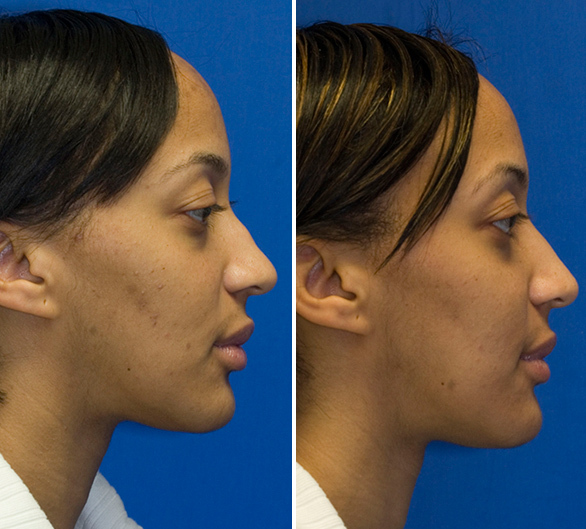 This concept of skin redraping relates to the issue of how much of a reduction to make during hump removal. 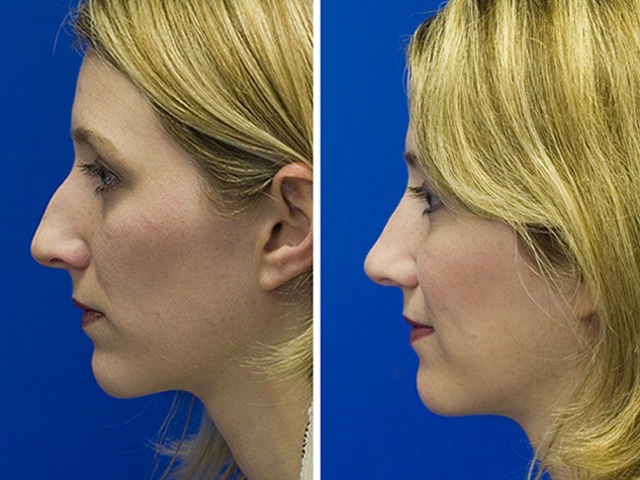 Though some level of hump reduction should still be possible, in patients with thick skin it may not be possible to reduce the size of the nose quite as much as desired. 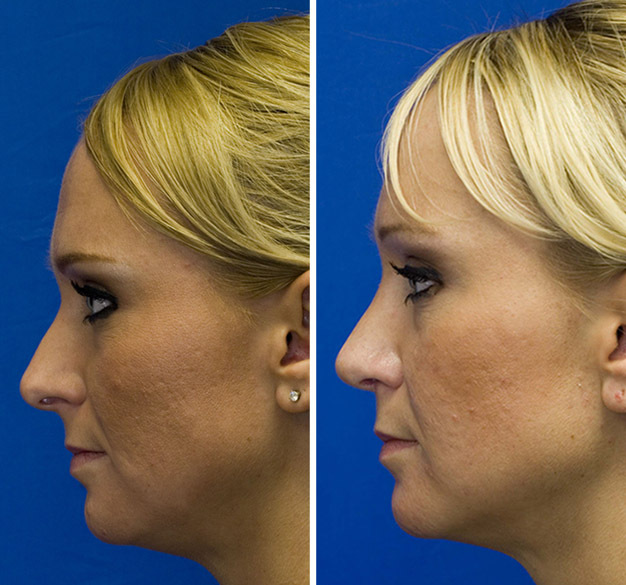 If the skin won't be able to adequately shrink wrap around the newly downsized nose the result may be an amorphous blob of skin that would likely make the nose look worse. Surgical judgement is needed to assess how well any given person's skin will accommodate this Shrink Wrap Effect process. Generally, younger patients and patients with thinner skin will redrape very well. Older patients and those with thicker skin won't be able to redrape as vigorously. 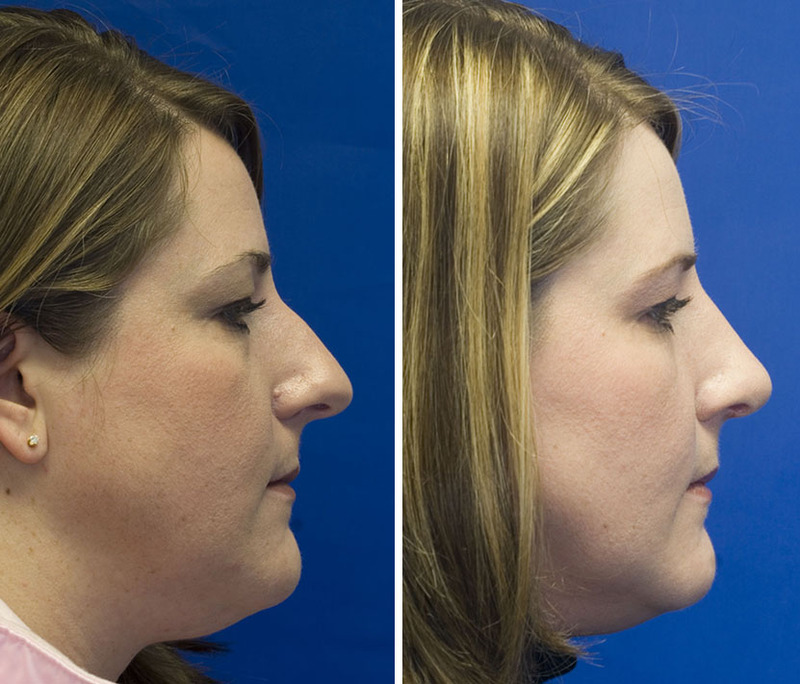 The risk is that the excess skin will visually result in a bulbous, ill-defined nose. 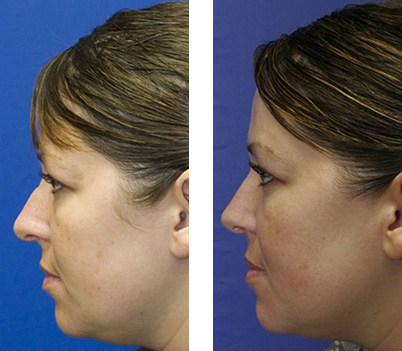 This patient is a great example of the factors that allow for excellent skin draping. She is in her early 20s and has relatively thin skin. Thanks to these findings quite a bit of excess nasal dorsum was able to be removed. This created a less projected and over-sized nose. Over time, her skin was able to vigorously shrink wrap around this smaller structure. Now her nose is more feminine and better fits her face. In contrast to the above patient is this gentleman. 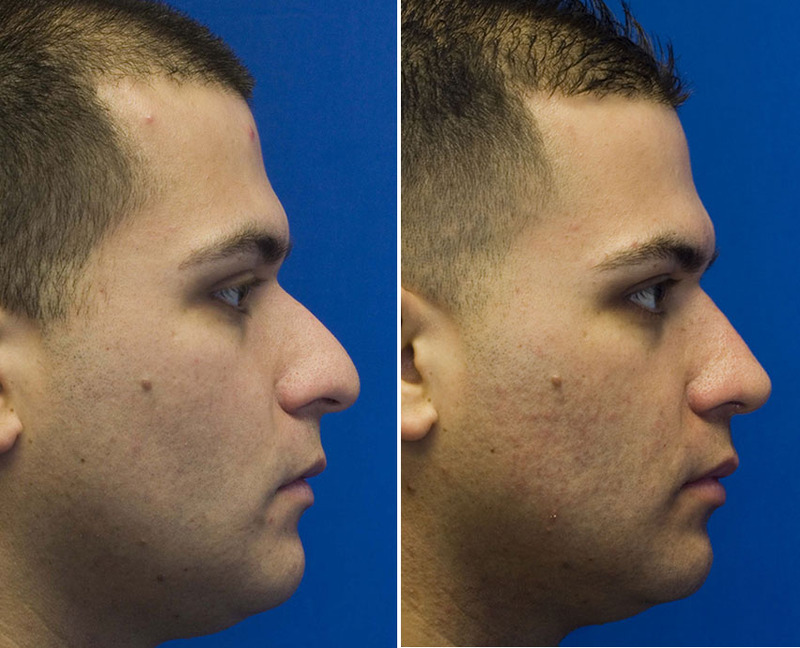 He was interested in creating a smaller nose, but as you can see his skin is much thicker than the prior patient. Also, he's a bit older as well. This doesn't mean that you can not make any changes to his nose. 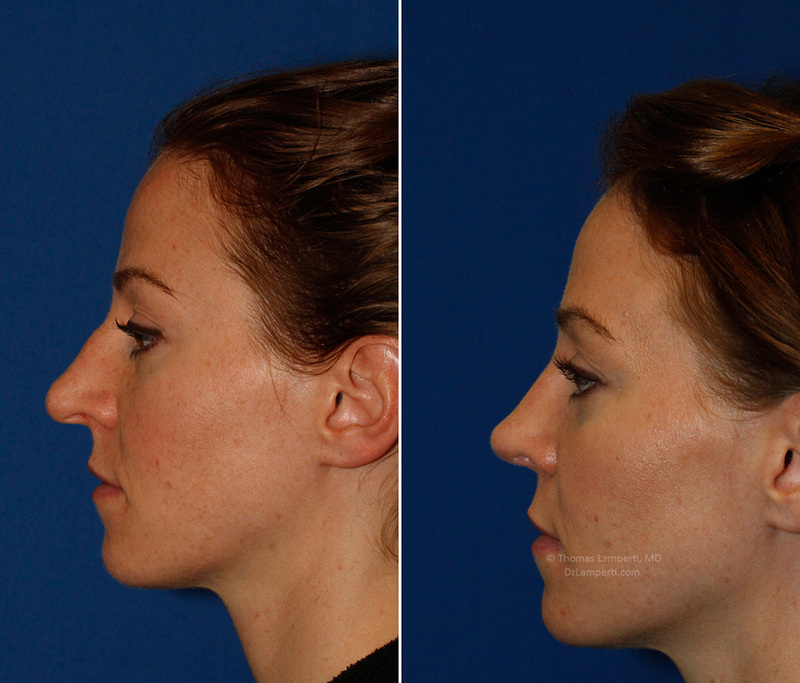 You just have to temper the "ideal" smaller nose with what surgeon judgement foresees it possible to achieve. 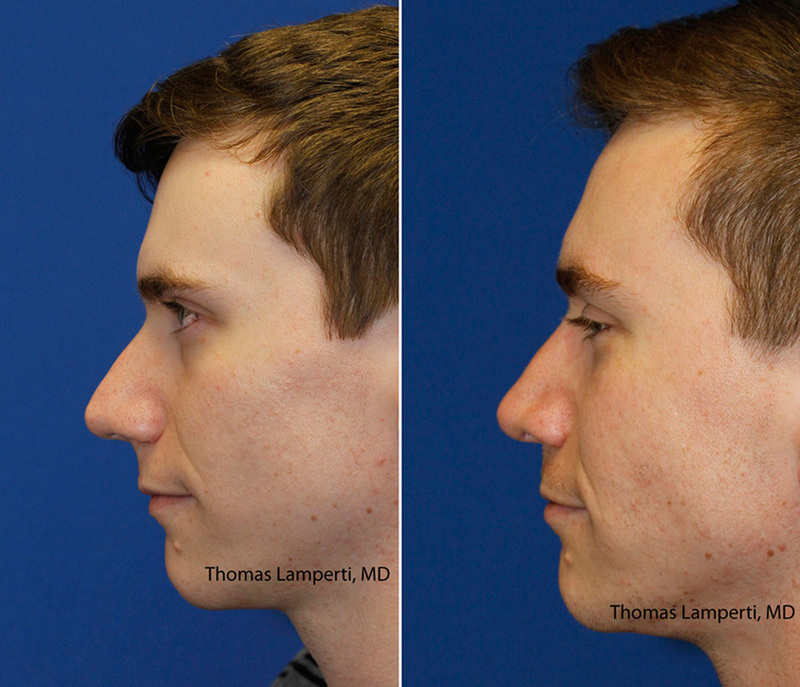 In the before and after photos above you can see how a noticeable reduction in the patient's hump was achieved while maintaining a masculine, natural appearing nose. Is your hump due to excess bone, cartilage or both? 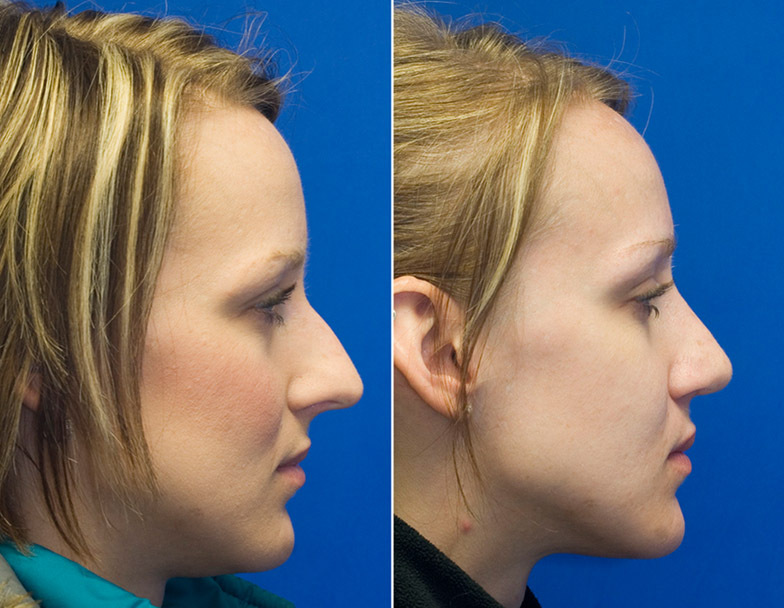 It turns out that not all nasal bridge humps are created equal. The bridge is actually composed of bone in its upper third and cartilage in the remaining lower two-thirds. 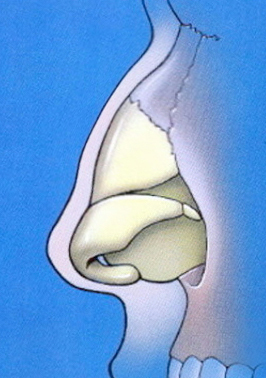 The schematic drawing below shows this nasal anatomy nicely. Some people's humps are limited to the upper bony portion of the bridge. 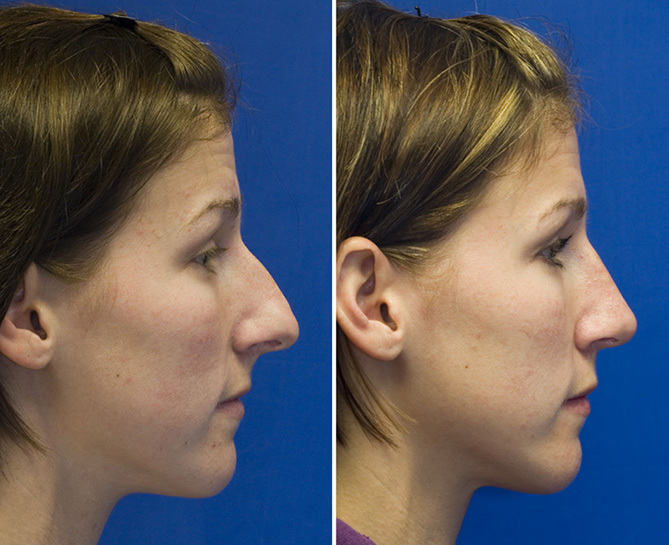 This can be addressed during rhinoplasty by removing the excess bone only. Other people may have a hump that is due to excess cartilage. This would be best treated by trimming the cartilage that is causing the dorsal fullness. By far, the most common scenario is a hump that is composed of both excess bone and cartilage. This is shown below in the following schematic figure. A combined approach in which the bone is removed and the cartilage shaved needs to be used in this situation. This allows both the bone and cartilage to be brought down to the proper level to create the desired profile line. Do you also need a radix graft? 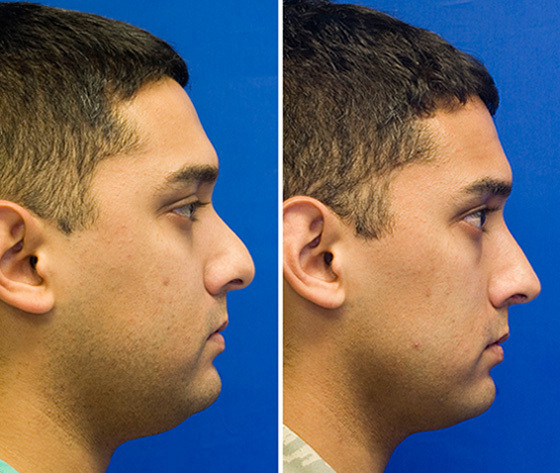 Your surgeon should assess your nose to see if you have a pseudo-hump deformity. 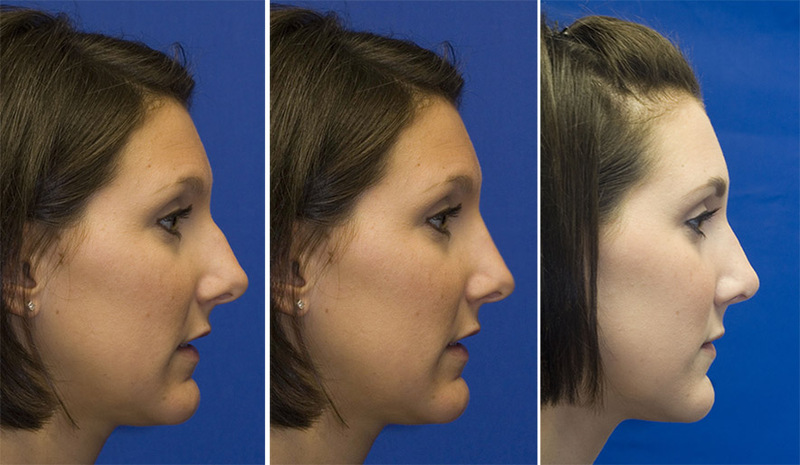 This results when the upper bony part of the bridge (radix) is under-developed which leads to perceived excess fullness along the profile line below the radix. Learn more about radix grafting here. Do you need to have prophylactic spreader grafts placed to prevent delayed middle third collapse? You should ask your surgeon if he or she plans on placing spreader grafts after your hump reduction. It's important to understand that spreader grafts may be needed even in the absence of pre-existing middle third (internal nasal valve) narrowing or collapse in order to adequately support the upper lateral cartilages after hump reduction. As the overlying skin and soft tissue shrink wraps after hump reduction quite a bit of scar contracture occurs. Over the course of years this can lead to the onset of middle third narrowing or collapse. This can cause unwanted aesthetic and functional breathing effects. 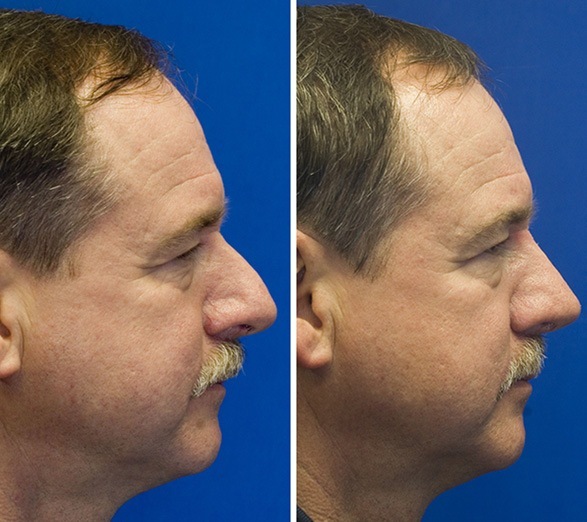 Whether spreader grafts need to be placed during your hump removal depends on how much of a hump is removed and whether the bridge reduction involves the middle third of your nose where the upper lateral cartilages are located. 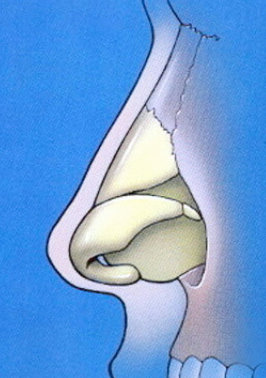 An alternative method of supporting the middle third of the nose after hump reduction is to use an auto-spreader graft technique. This involves using excess upper lateral cartilage tissue itself as the supporting material.